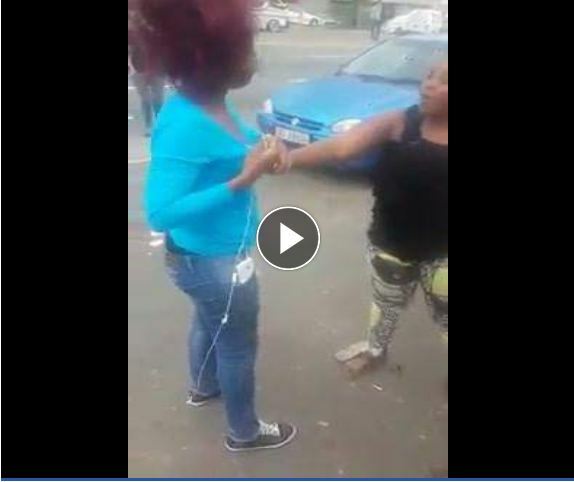 A video has emerged on social media in which two women alleged to be Malawians are seen fighting in broad day light in the streets of South Africa. According to a Facebook user who shared the video online, the two women had got into the fight because of a man who is said to have been bedding them both. However, the source did not specify from which street of South Africa the shocking incident took place as well as the names of the two women alleged to be from Malawi. In the video, the women can be seen pulling each other’s hair while spectators are circled around them. Passing by people seem to be enjoying the fight as none of them could come to separate the furious women. But luckily, at the end of the video clip two men came from nowhere and separated the women who were both wearing tight trousers.